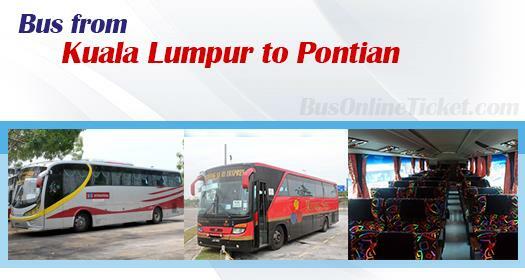 Bus from KL to Pontian is so popular because of its direct bus service to Pontian without stopping at Johor Bahru. Long before the direct bus service from KL to Pontian, passengers who need to go Pontian from KL require to stop at Larkin for transit. Passengers going to Pontian now feel relief with this direct bus service to save their transit hassel. Mayang Sari and S&S International are the only two operators serving bus from KL to Pontian. Mayang Sari has multiple departures from KL TBS to Pontian daily starting from morning 08:00 to evening 23:00. In additional to frequent schedule, Mayang Sari is also a bus company with good reputation in its bus service and on-time departure. S&S International is another player with strong presence in Johor because its headquarter is in Kluang. They provide several departures from KL TBS to Pontian daily from 13:20 to 21:00. Duration required for bus from KL to Pontian takes about 4 hours depending on traffic condition. The coach would have a stopover along the highway for passengers to have food and toilet break. Bus from KL to Pontian costs average RM 28.00 per ticket, which is slightly lower than KL to Johor Bahru bus fare at RM 34.00. Bus leaves from Kuala Lumpur TBS (Terminal Bersepadu Selatan) which is the air-conditioning and central-ticketing controlled bus station. TBS at Bandar Tasik Selatan is slightly off from the heart of Kuala Lumpur, but public transport like LRT can connect travellers to TBS. At the end of the journey, the coach terminates at Pontian bus station. Due to limited direct bus service from KL to Pontian, passengers are better to book online in advance with BusOnlineTicket.com to avoid taking bus to Johor Bahru with additional transit to Pontian. The booking process is user-friendly and payment is secured.